It’s been nearly a week on the Vegetarian diet and so far so good! I’m a little obsessive and have been spending a lot of time typing up and revising my ‘diet plan’. I’ll let you have a look at it. By the way, I got the date of Chap Goh Meh* wrong so ignore it. It’s on the 6th Feb instead. I’m also reintroducing fish and chicken in the second week. 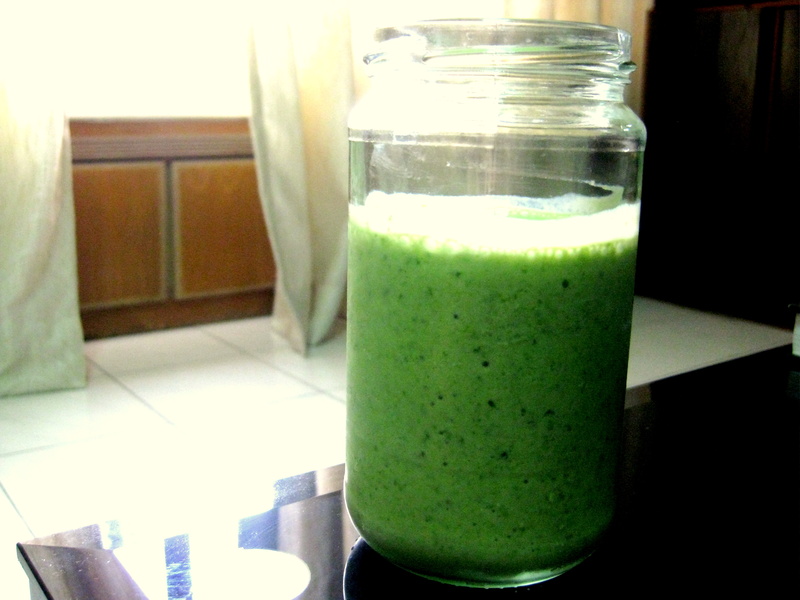 I’m sipping a green smoothie as we speak (bananas, baby spinach, lemon juice and yoghurt), it’s delicious, despite the intimidating bright green hue. Give it a go! 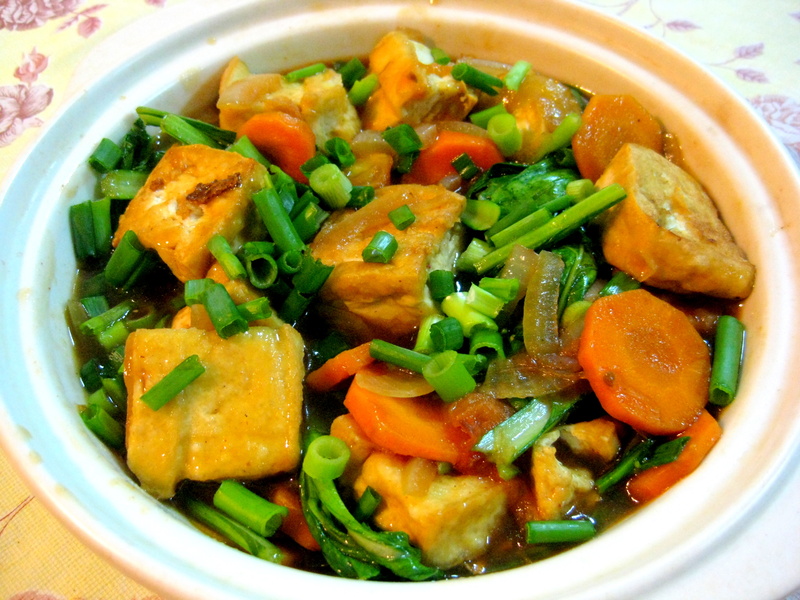 The recipe I’ll share with you today is the humble Claypot Tofu with Vegetables. Tofu, another highly nutritious food and a perfect substitute for meat. It’s high in protein, low in fat, rich in Calcium as well as Vitamin E. The downside is that it tends to absorb oil. To counter that, use shallow fry method instead of deep frying, and made sure you blot the oil away after. The beauty of this dish is that you can use any combinations of vegetables, and even meat. Mushrooms, baby corns, mince pork, prawns, use your imagination! I prefer to let the tofu shine as the main protein, rightly so too as it’s superior to meat protein anyway. As for the sauce, instead of the usual brown version, I’ve used a tomato based one which has a slight tang to it. Very appetising! Prepare the tofu by draining all the fluid and patting dry. Then cut into 1inch thick rectangles. Heat enough oil to shallow fry the tofu until golden. If the tofu slices aren’t dry enough there will be some spluttering. So be careful. Transfer to a plate covered with paper towels to absorb excess oil. In a claypot, heat a tablespoon of sesame oil and peanut oil. First add the onions and garlic, when soft and fragrant add tomatoes and carrot. Stir around for 2 minutes or until carrot starts to soften. Add Shao Xing wine, vegetable stock to simmer for 3-4minutes. Season with soy sauce, oyster sauce and cayenne pepper. Mix cornstarch with a little bit of water to form a paste and add to the mixture. Add Choy Sum and the tofu slices. Cover the claypot for about 2 minutes. Turn off the heat and sprinkle scallions on top. Serve with brown rice or black rice for extra fibre. Looking forward to making the Cannelloni tonight! Good luck with the diet. I have been trying to do one day a week of solely vegetarian meals – this claypot dish could go well for that. i sometimes grill the tofu with some miso and vegetables. btw tried tofu with tomatoes and spinach? they make a yummy combination too. but not so kind to those with gout. Another one I love is with century egg and mince pork, but then it becomes unhealthy. Hehehehe. I’ve planned like a whole month of vegetarian meals! Gotta break it though for Vday. 😀 steak dinner instead.